Donald Edward Rainsford came to Carlton from Tasmania in 1959 hoping to make a career as a VFL footballer. Instead, his journey across Bass Strait opened the door to lasting fame as one of Melbourne’s most popular radio announcers. Don and his twin brother Malcolm were football prodigies from their early teenage years in the Island State. At the age of 13, Don was a giant, already nearing his full height and weight while playing for Burnie High School. It wasn't long before the young footballer was noticed by former Richmond player Ray Stokes, who invited him to the Burnie Football Club. Three years later, Don caught the eye of Hawthorn officials when the Hawks were in Tasmania on an end of season trip. He had just turned 17, and had made sporting headlines when he played in the Burnie Football Club's Premiership team of 1954. Hawthorn signed him on a Form Four, which tied him to the Brown and Gold for two years. Then early in 1955, Malcolm and Don crossed Bass Strait and tried out with Hawks in a couple of pre-season practice games, but neither was yet ready to leave their home state. The twins’ father was a police inspector, and shortly afterwards the Rainsford family moved to Scottsdale in the north east of the state. Don transferred to the Scottsdale Magpies, where he was coached by Carlton Hall of Fame Member Bob Chitty. At around the same time, Don began working at radio station 7SD as an office boy and junior rouseabout, before he was eventually given an opportunity as an on-air announcer. His deep voice was perfectly suited to radio, and over the next couple of years he polished his craft. Meanwhile, Chitty and another former Blue; Fred Davies (who was coach of Longford at the time) continued to urge Rainsford to have another shot VFL football with the Navy Blues. In September 1958, Carlton hosted 20 year-old Don and his wife Wendy at the VFL Grand Final, where club stalwart Ken Hands talked him into signing with the club. A job in Melbourne radio was promised, probably with the assistance of prominent Carlton supporter Oliver J. Nilsen - owner of station 3UZ. The station's general manager, Lewis Bennett, apparently didn't care if Don was a good footballer or not, because it was he who decided who was hired and fired. But he reluctantly gave the footballer an audition, asking him to read a news bulletin and couple of commercials. Rainsford complied, passed the test and was hired him on the spot for a one months trial. 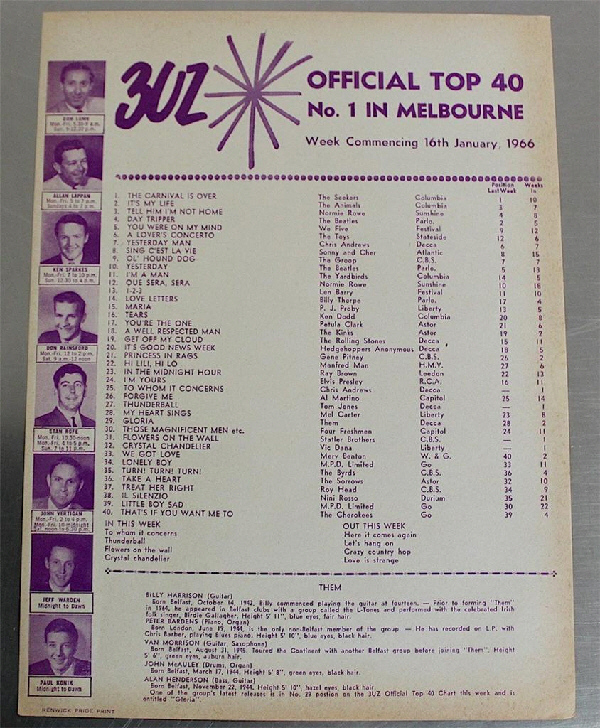 However, Don soon found difficulty in juggling his radio shifts with his football commitments, especially when the Carlton Cricket Club made the finals in 1958-59 and Princes Park continued to be used for cricket each Saturday. To overcome this situation, in the pre-season of 1959 the football club switched their practice matches to Sundays – and this conflicted with Don's afternoon on-air shift. He found that the only way to cope was to change into his football gear in the studio, then race out to Princes Park in time for the last quarter of the trial games. Despite those difficulties, Rainsford’s form with Carlton Reserves in the early part of the season eventually earned him promotion to the Blues’ Senior side for the first time in round 11, 1959, when the 21 year-old ran out onto Princes Park in guernsey No. 40 to take on St Kilda. On a cold, wet and blustery afternoon Carlton won easily, and Don kept his place in the side for the following week’s assignment against Essendon at Windy Hill. In that match, the Bombers jumped Carlton from the first bounce, and although Rainsford experienced the thrill of kicking his first and only career goal, the Blues were well and truly hammered. Rainsford was one of a number of omissions from the team for the following week, and he wasn’t recalled until late in the season when Carlton scored a thrilling 2-point victory over Hawthorn at Princes Park. At the end of that year, Don was faced with some big decisions. His popularity at 3UZ was increasing and it was obvious that he had bright prospects, but the station was urging him to choose between his radio career and football. Meanwhile, there was dissension at Carlton, with the club split over loyalty to incumbent coach Ken Hands and his former close friend Jim Francis, who had left the club in 1958 in bitter circumstances. In the end, Rainsford chose to end his time at Carlton and join VFA club Williamstown, where the training demands were less intense (and they paid him more money). After a couple of seasons at Williamstown, Don crossed to Federal League club McKinnon, as his radio career went from strength to strength. He became a star personality at 3UZ for 10 years, before he was lured to rival radio station 3AW and eventually into television at HSV-7 Melbourne. Tragically, Don died of cancer aged just 51 in 1989, leaving behind his widow Wendy and three children. Don’s twin Malcolm also died too young - passing away in Sydney in 1976 aged 39. A memorial plaque for Don can be found at the Scottsdale Cemetery in Tasmania. "A case of twins with opposing loyalties is that of Don and Malcolm Rainsford, 15 year-old sons of Inspector C. E. Rainsford of Burnie. At West Park on Saturday Don, in Burnie seconds, faced up to twin Malcolm, in Cooee seconds. To keep the honours even, each kicked a goal. Both boys attend Burnie High School." The Age newspaper of March 23, 1960 reported that Don had been given permission to train with Mordialloc. Later, on June 10, the same paper reported that he had been bought back into the Williamstown team to play at centre half forward, after regaining form in the seconds. Click the link to Rainford's Blueseum Image Gallery at the bottom of this page to read the Melbourne Observer's 1972 newspaper interview with Don, where some of the information on this page was sourced. Outside of football, Don Rainsford had a successful career as a disc jockey and on-air announcer for radio station 3UZ (now Sport 927). He later worked for 3AW and as a television voice-over announcer for Channel 7 Melbourne. In the early 1970's Don was the voice of Channel Seven’s promotion "The Seven Revolution." Click this link to hear Don's voice-over for HSV7 - "Promises Promises :"
"Don 'Crasher' Rainsford was a special man, and I am not saying that to pay lip service. Don was a straight shooter and a valued member of the 3UZ Team. ‘Team’ was the difference with 3UZ, because we all worked as one, yet did not live in each others space." In Don's Image Gallery there are two photos of Don at the football club with two elderly gentlemen. These two men were unknown, but thanks to (the now late) Ken Sparkes he identified them as 3UZ's owner Oliver J. Nilsen and UZ's Programme Director John McMahon. Photo courtesy of, and taken by 3AW radio personality (now the late) Keith McGowan. 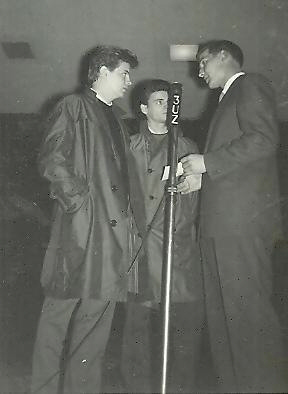 Keith worked more than 50 years in the radio industry starting at age 14. A cavalcade of UZ's deejay 'stars', most of them household names with Melbourne's 'baby boomer' generation. Top; Don Lunn ('Daddio of the Radio'), Alan Lappan ('Lap-Lap'), Ken Sparkes, Don Rainsford, Stan Rofe ('Stan the Man'), John Vertigan, Jeff Warden, and Paul Konik. 25% of this Top 40 are Australian artists. Contributors to this page: blueycarlton , PatsFitztrick , Bombasheldon , molsey , pblue , tmd1 , true_blue24 , p(12)terg and admin . Page last modified on Saturday 16 of December, 2017 08:19:33 AEDT by blueycarlton. 1983 Rd 21 - Bruce Doull spoils the pack.